UNITED NATIONS, December 3 -- Criticized for his delay in implementing a new system of justice in the UN, Ban Ki-moon has sprung into action, posting notices of job openings on the UN's intranet and blaming his delay on the member states. But sources tell Inner City Press that for many of the jobs purportedly being advertised, candidates have already been identified outside of the formal process. The UN Staff Union has presented a counter-proposal to the members of the European Union; they say that Ban is violating at least four provisions of the Universal Declaration of Human Rights he is set to celebrate on December 10. Most notably, Article 8 says that "everyone has the right to an effective remedy by the competent national tribunals." On that theory, the Union says its prepared to file cases in the U.S. courts starting January 2. On November 21, Inner City Press asked Ban's spokesperson Michele Montas about the delay, and "what is the plan for January 2?" Ms. Montas replied that "we’ll find out, first, whether they will be able to start as planned in January... to avoid any vacuum in the justice system." After some of the decision-makers the UN had been counting on began to resign or threaten to, and Inner City Press wrote the story, European countries asked the Secretariat, what is going on? On December 2, the Secretariat put on its internal i-Seek web site a statement quoting Under Secretary General Angela Kane that "we are behind schedule. This is partly due to a delay in the adoption of the statutes by the General Assembly." First, blaming the bosses -- that is, the GA -- is rarely a good idea. Second, Ban was already given a one year extension, and now is reportedly preparing to ask for six months more. He intends to hold over many of the same people who made the justice system broken in the first place. 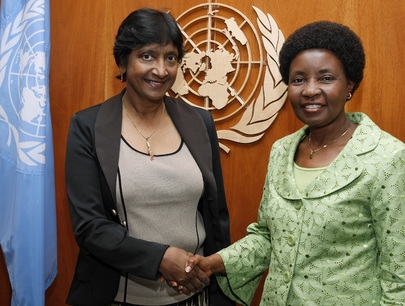 UN's Ms. Migiro, HC of Human Rights Pillay: but do human rights obtain in the UN? In a purportedly confidential submission to the General Assembly on "Item 129, Administration of Justice," the Secretariat says that "for any of these options, structures of the current system would need to be retained... including the Panel of Counsel, the JAB/JDC Secretariats, the UN Administrative Tribunal, and the legal unit of the EOSG that advises the Deputy Secretary General on taking decisions on JAB and JDC recommendations." One of the flaws of the current system is that there is no separation of powers: the Secretariat, which is most often the defendant in these cases, can simply ignore and not follow the "recommendations" that are made to it. Even in the proposed new system, the Ban administration is trying to avoid "specific performance," that is, having to give someone back their job. The idea is that damages are enough -- money paid for by none other than the member states. For Ban to blame these member states for his own delay will prove unwise, many diplomats are saying. We'll see.